A great way to do this would be to append your report to a SharePoint modern page so that other relevant data (documents, links, and even a discussion board) is readily available to enhance your work. PowerBI reports can now be securely embedded within SharePoint modern pages. The embed is pretty straight forward. First, you have to generate the link to the report using the “Embed to SharePoint Online” option. The only potential pain point is when it comes down to actually sharing the page and report with other users within your organization. The keyword here is privately. 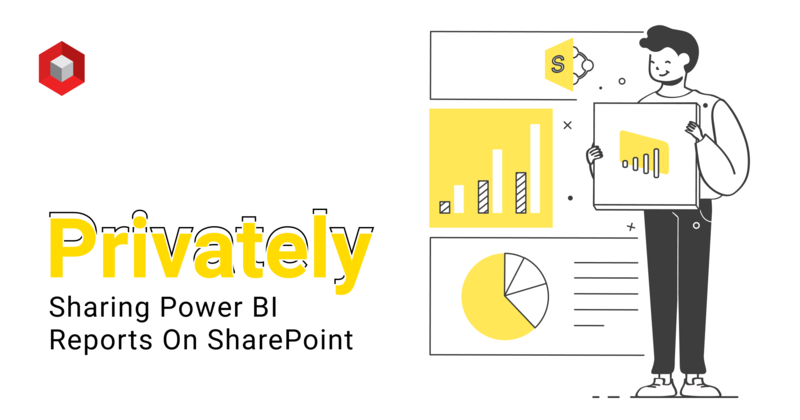 The ability to publiclyshare your reports and data is always possible for Power BI free and Pro users without limits or restrictions. However, at some point you will likely need to share information that must remain within your organization or that is restricted to a subset of users, and in that case you will be limited to the two options below. Upgrade every user within your organization to Power BI Pro. The obvious downside here is that you may end up overpaying for certain users to just “read” data. In fact, not only do you need a Power BI Pro account to publish a report/dataset, but you would also need a Pro license to read private reports. Yes, you read that right: without a Pro license, accessing a private Power BI report embedded (or not) into SharePoint will result in an error message. Use Power BI Premium! As described by the Power BI team, Power BI Premium can “enable anyone — whether they’re inside or outside your organization — to view all Power BI content including paginated and interactive reports without purchasing individual licenses.” Sounds good, right? Well, the premium license is $4,995 USD/month to support roughly 2,000 users of varying usage. Additionally, a couple of Pro licenses will likely be needed to publish the report (for the “data” or “analytics” team of your organization). While the pricing does sound pretty steep, when you do the math for a per-user basis, your organization can gain access to Power BI reports for $3–$5/user/month. Alternative 1— Instead of providing the display of the report, you can share the .pbix file for users to open with the Power BI desktop. Again, not ideal, but this can be a solution if you have a tight budget. Alternative 2 — Set your data and reports to have anonymous labels and unidentifiable information so that publishing your report publicly does not reveal any private information about your company/users/sales, etc. You can then embed the report into your SharePoint pages and create the labels in the page (instead of in the Power BI reports). This trick will suffice if you only have a few reports out there. I have a third alternative option if neither of the above work for you. If you are interested, feel free to email me and I will share the information. I’ve shared with you the guide on how to privately share Power BI reports on SharePoint. Here at NIFTIT, from Office 365 consulting to SharePoint solutions, we can handle projects of any size and difficulty. We follow industry standards and best practices to build world-class solutions. learn more about our office 365 support here!